Remember a site we started to create in previous articles. What we’ve got is simple web application, with a registration functionality. During registration you submit email, password and secret phrase. We going to use this secret phrase today to recover forgotten passwords. Functionality is bit artifictial but my goal is to demonstrate usage of ASP.NET Ajax framework, namely ScripManager object as very usefully component for ajaxifying your applications. Script Manager is really powerfull component and one of major feature is how it simplifies working with web services. So, let’s add ScriptManager to application. The place to do that are typically MasterPage to make ScrpitManager be accessible from every content page. 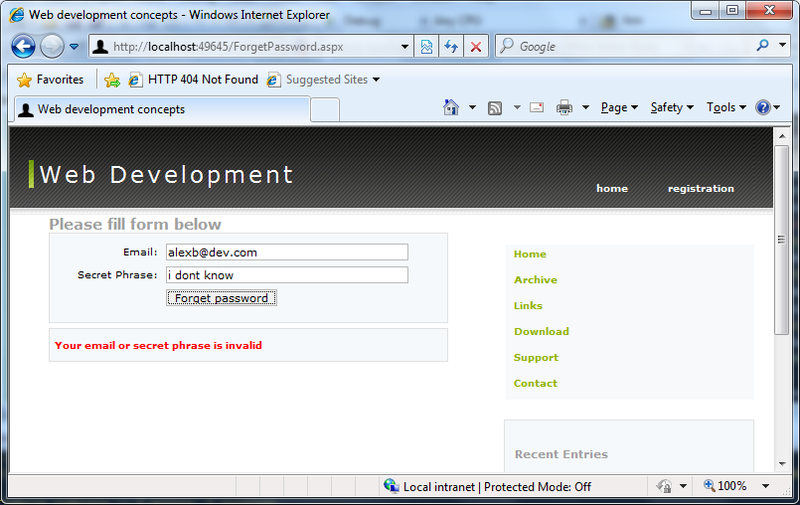 It have to be placed in ‘form’ with runat=”server” attribute, otherwise runtime exception will appear on page loading. Script Manager contains two references - ScriptReference, ServerReference. It is a declarative way to add references, in the same time it is possible to do it programmatically (that is more complicated). What you need to do is to add such declarations, the rest will be done by control. Next, we will add forgetpassword.js script to script folder and new web service instance to services folder. Now, application ready for AJAX! As soon as we see its OK, let’s do some real work. If users email and secret pharase matches corresponding record in database, we going to show user password on screen without reloading of page. 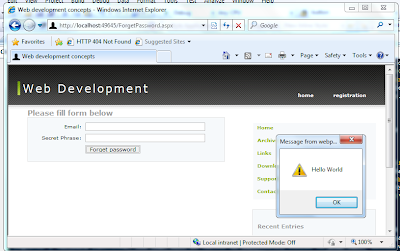 We will add new business object and implementation for recovery of password. I would just paste tests and code of business object (as it is really small and simple one), the rest implementation you will be able to see by going to GitHub. (for ones who followed my previous articlies - I’ve done some refactoring switching to Repository pattern for DAL, since it is more correct and reusable way of working with data, please see details in code). 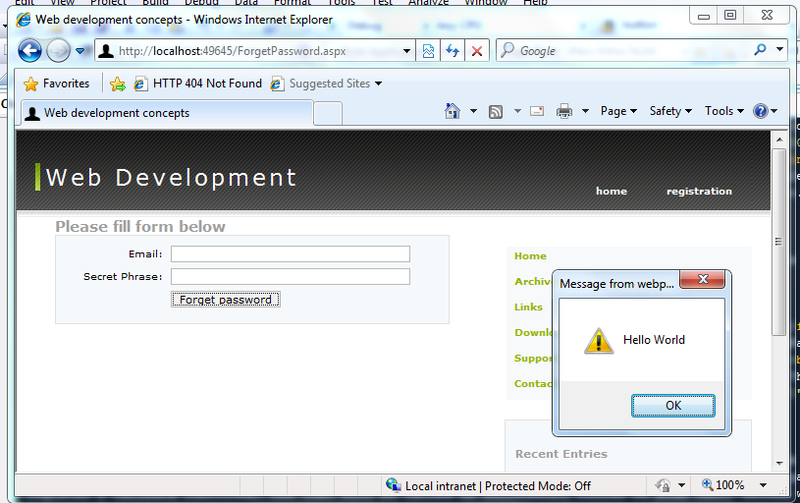 After it is ready and tested we are going to integrate with object to Web Service method call. Nowadays it is even hard to imagine serious web application with out AJAX. It is mostly everywhere. Because of such usabilty and popularity a lot of vendors proposing tools and framework to hanlde common AJAX issues. And of cause, tools for working with AJAX is started to be included to .NET framework. ScriptManager is only one part of it framework. For futher exploration I would recomend to look on ASP.net AJAX Toolkit that is build upon .Net framework abilitites and propose a lot of interesting controls. Moreover, it is open source and you can go ahead and hack it or contribute it.